Mature woodlands and forests populated with deciduous trees remove significant quantities of carbon dioxide (a greenhouse gas) from the atmosphere, locking it up in complex organic carbon compounds - such as starch, cellulose and lignin. Such compounds add to the biomass of the trees. However, come the Autumn deciduous trees shed their leaves, and in Autumn and Winter winds break off branches and twigs. These dead leaves and twigs etc contribute to the ‘litter’ on the woodland floor and the humus in the soil. This material represents a vast source of ‘locked up carbon’. In the distant past such woodlands ran ‘wild’ - as in the wildwood that developed after the last Ice Age, or were managed (e.g. coppicing) in a sustainable way. 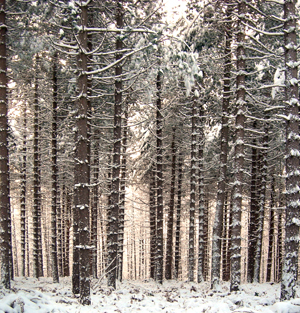 However, in more recent times the practice of forestry has been concerned with faster growing, commercially valuable trees for timber and paper production; hence the afforestation of vast swathes of countryside with coniferous trees such as Norway Spruce, Larch and Scots Pine. Since 1750, , the region under woodland and forest has grown by 10 percent across Europe. 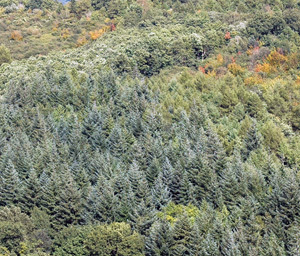 Though coniferous woodland is generally species poor (low in biodiversity), this planting was generally seen as being “a good thing” - more trees and hence more carbon dioxide being removed from the atmosphere in photosynthesis; and timber to be harvested. However, some recent research (Dr Kim Naudts et al. at the Laboratory of Climate Science and Environment in Gif-sur-Yvette, France) has questioned the large scale planting of conifers - especially in areas that previously supported deciduous trees. Conifers are generally darker than species like oak and beech - consequently they differ in the amount of light / radiation that is reflected back into space. That is, they have a different ALBEDO or reflection coefficient. Snow has a high albedo, it reflects much of the light that hits it back out into space. Dark objects reflect less light / radiation and absorb more - i.e. trapping heat that would otherwise be reflected back into space. So, by planting conifers we are contributing to global warming. The researchers have calculated that the trees have contributed to an increase in temperature equal to 6 percent of the global warming attributed to the burning of fossil fuels.